3438 place | Vector illustration in rank M-rank: Isometric Business Success Concept. Entrepreneur business man leader. Businessman and his business team crossing finish line and tearing red ribbon finishing first in a market race. 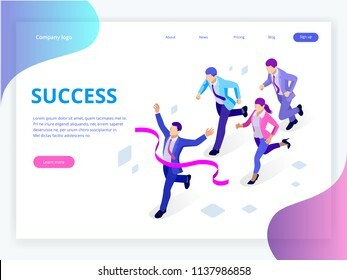 Isometric Business Success Concept. Entrepreneur business man leader. Businessman and his business team crossing finish line and tearing red ribbon finishing first in a market race.